It’s a shame that UK tenor Russell Watson didn’t have this album ready to go last week because it would have been the perfect gift for mums all across the country. However, the new album is not due in Australia until early next month. 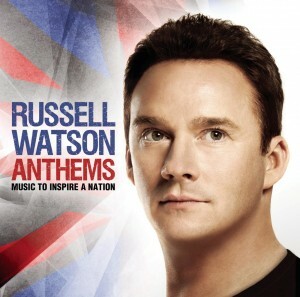 With the London Olympic Games just two months away and with HRH Queen Elizabeth II celebrating her extraordinary diamond jubilee in 2012, Russell is releasing ‘Anthems’ – a collection of songs that aim to inspire pride and a sense of identity to the people of Britain. Included in the tracklisting are cover versions of Queen’s inimitable ‘We Are The Champions’ and Heather Small’s ‘Proud’, along with British staples ‘God Save The Queen’ and ‘Land Of Hope And Glory’ and traditional songs like ‘Abide With Me’ and ‘Danny Boy’. ‘Anthems’ will be released in Australia on Friday June 01.